Freemasonry constitutes the world's oldest and largest fraternity. The Masonic experience focuses on enlightened fellowship. It encourages members to become better men, better humans, better husbands, better fathers, and better citizens. The fraternal bonds formed in the Lodge help foster life long friendships among men with similar values about universal brotherhood and spiritual enlightenment. Virtually all occupations and professions are represented, yet members meet as equals. Brothers come from diverse political ideologies, but we meet as friends. Freemasons come from varied religious beleifs and creeds and all believe in a supreme being. If you are interested in joining us or would like more information about Freemasonry, please don’t hesitate to contact us. 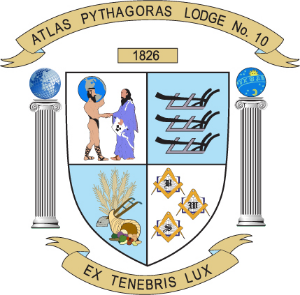 Our lodge meets on the 1st and 3rd Fridays of the month at 7:30 p.m.
** Are you a member of Atlas Pythagoras Lodge? Would you like to stay connected with your brethren and join our email list and be notified electronically of the latest news related to our lodge? Join our Private - Members only - Lodge Email List on Yahoo! You must provide your full name, phone number, lodge name and year you were raised to be able to join - The List is restricted to AP10 members only! !